Last week was one of the best weeks I have had in a long time. I go away each year and play in the Highland Open golf tournament at Pitlochry with a group of friends. This year I went with the same group of friends but because of how my health has been and my asthma control I decided to stay at my mum and step dads house in Fearnan on Loch Tay instead of staying with friends. I figured I could still see them all during the day but would be best to have a quiet calm night. This made such a difference. The last two highlands I have really struggled and probably not enjoyed them as much as I could have but by taking my chest into account and realising the impact such a full on week has on it has benefited me and meant the week was great. I was disappointed not to be staying with everyone but when I look at the fun and enjoyment I got out of the days and being able to participate in everything it has defiantly been one of the best decisions I made. Before I went away I was having a pretty stable patch although still on a pretty high dose of prednisilone and needing 3 nebs a day and increased pain relief I was pretty stable. The cocktail of pills and inhalers had me in a really good place. I emailed my consultant before I went away about the pain in my chest I have been having and was given increased win killers to help which I am so glad I did. I could play golf virtually pain free. I also recognised that mentally I was needing a little more help so we increased my anti depressants a wee bit too and the combination has paid off. As a result I played some of the best golf I have ever played although the one match I needed to play really well was ironically the time i played the worst golf but every cloud has a silver lining as because I lost this match I was able to play in a different compition which I then went on to win for my section!!! I have also cut my handicap and am playing off the lowest I ever have too so all things in the right direction. Being away and spending time at the cottage on my own at night has given me a lot of thinking time and I have been able to put everything into perspective. I thought a lot about my health and my asthma. I have been very absorbed by it recently because I have been so symptomatic I think and therefore always thinking and worrying about it. To enable me to cope with the golf I increased my pain killers and didn’t reduce my steroids and took my reliever inhaler regularly instead of when I needed it and found that this actually helped. I was not worried about becoming symptomatic and then requiring more inhaler. I may be going over kill with it but by feeling good think it is worth it. I don’t have a golf week now but I am going to stick with this regime for a wee while and see how I go. I see the reps nurse specialists next week and will discuss it with them. I am a little frightened of rocking the boat just now as I feel so good. It also gave me time to think about my family and what they mean to me etc. My family mean so much to me and value them. There have been massive changes recently which I have fund very difficult to cope with and have not really spoken to anyone about it but get irritated by small things instead that happen when really they only care. I want to try and talk more to them and let people now how I feel. The positive swing on everything has really boosted me. I feel much more content and don’t feel so tired and lethargic. I know I have had a weeks holiday but I think work is less active than the golf week. I played 7 rounds of golf in 6 days. My whole outlook has kind of changed. 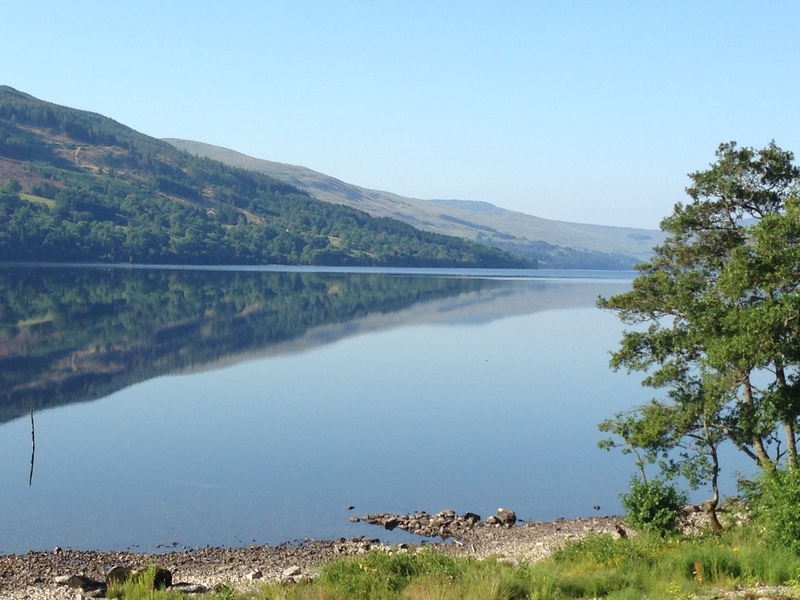 I will post a few photos below so you can see why I love Loch Tay so much and Pitlochry. If I am able I would love to live there one day. I have a bundle of appointments coming up in the near future. As I said earlier I have the respiratory nurses to see next week. I have a CT Scan to see how my lungs are doing. I have an appointment for a second opinion (more on that) and then will be seeing my consultant as well. I normally dread appointments but I am looking forward to seeing the nurses and eating them know how well I feel and what I have done to achieve this. It may not be what was suggested but its working and to me that is the main thing just now. I mentioned just before I have a second opinion appointment with another respiratory consultant. My consultant is fantastic however I just wanted to see someone else to see other suggestions of treatment. Although I am feeling very good just now to achieve this I am taking more medication than I think I have ever done. So to see someone else and get their opinion and to see if there is anything else except steroids I can try. This appointment is not till the end of august so a wee bit to wait yet. In between working I am playing a lot of golf. Being able to do something I enjoy and am getting good results is such a mood lifter. It makes me feel good and like I used to when I was playing competitive sport. I have managed to cram my diary full with golf stuff when I am not working and the weather is so perfect just now it would be mad not to.